Whilst it was certainly that in some respects the people in this film really did little more than get in the way. Literally and metaphorically. In the same way that Raiders of the Lost Ark would have exactly the same outcome if you took Indiana Jones out of the picture, Godzilla would have exactly the same outcome but with few less lives lost if all the people just stayed out of the way. In the trailers Bryan Cranston's character, Joe Brody, a former Nuclear Power Plant employee, emphatically accuses "Because what's really happening is that you're hiding something out there! And it is going to send us back to the Stone Age! God help us all..." It's a great line but it really makes no sense... Big monsters wandering the Earth... maybe... but they didn't have cities or even people in the stone age. In the end it was dramatically overstating on the events that unfold in the film and might have seemed more relevant if the movie delivered what the trailer implied. A real battle between humans and Godzilla. What I got was a movie with some soldier, Ford Brody (Aaron Taylor-Johnson) wrestling with his Dad's erratic, crackpot ideas. Then kind of trying to stay alive because he's the only guy that knows how to work the machinery that may or may not stop the monsters that are causing havoc on American cities. Ford Brody is a character I might have cared about more if he didn't spend so much time just reacting to the events around him. Even when he had a goal all you could really do was watch him attempt to carry it out and hope he doesn't die in the process. He was no great intellect trying to match wits with a monster or two. 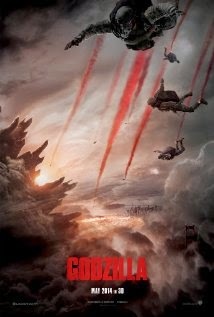 I can't really fault this movie in terms of the monsters, other than it took a long time for Godzilla to get into the main action. However when he did, it was full on Godzilla awesome complete with atomic laser breath. It's well worth seeing for just the monster sequences alone. It's definitely franchise worthy because it would be amazing to see this very realistic Godzilla go up against realistic versions of some of his previous foes in the early films. The human story however really needed some work. I would've liked to have seen more back story come into play. The movie states that nuclear bomb tests conducted in the 1950's were attempts to kill the monster but none of what they learned back then seemed to come into play in the present day storyline. It felt like no one was really communicating to make sure civilians got out of harms way once they understood each monsters motivations. The strategy seemed to be all about stopping the monsters simply by blocking their path with as much military hardware as possible despite knowing how ineffective that was. Yes I know the military did have a strategy to try and redirect the monsters but they still persisted in setting up troops in harms way knowing they didn't really stand a chance. If there is a sequel to this film - and I'm sure there will be - I hope they manage to give us some pseudo science that the characters can really get their teeth into. If this movie's subtext is really about 'man versus nature', as director Gareth Edwards suggests, then there's a whole story there about man trying to control nature that could give the people of the next film something really interesting to do. To sum up. Godzilla is a really good monster movie. For me it was pretty much how I imagined Godzilla should be. I was very happy that the movie started in Japan before moving to the USA because above all else, Godzilla is a Japanese creation - even if he was born out of the US nuclear bombing of Japan. If I could have got more interesting and better developed human characters it would have been just about perfect but perhaps we'll see that in a sequel... certainly don't kill off the most interesting character half way through next time! Well worth seeing. I really hope to see another Godzilla movie that builds on this and perhaps goes a bit more into the science and intellectual side of things whilst still giving us great monster battles.